This sign bets it all on going bold… and succeeds. 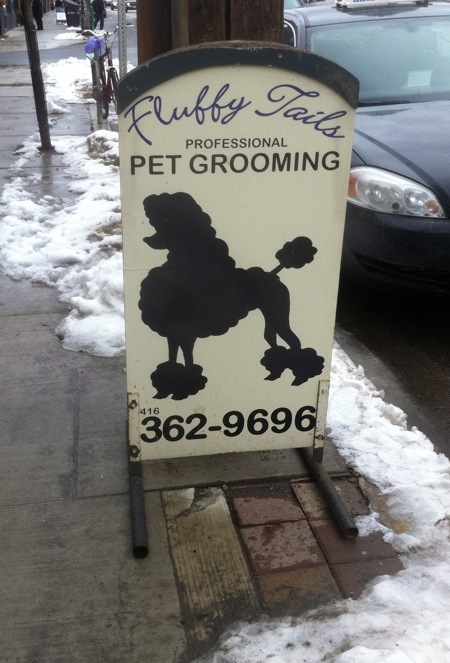 If the poodle silhouette were simplified it would become a pictogram, but as it stands it has too much detail to be one. There’s a pleasing contrast here between refined script and forceful image. Overall this is a very effective sign. This entry was posted on February 6, 2014 at 3:51 pm and is filed under Contrasts, Script. You can follow any responses to this entry through the RSS 2.0 feed. You can leave a response, or trackback from your own site.